Check out the Latin American Film Festival schedule for this up-coming Fall semester here. Front row, left to right: Lindsey DeLonga - German American Heritage Society Distinguished Student in German Language Award; Alisha Dillon - Helen D. Goode Memorial Scholarship; Mary Mang - Italian Cultural Association of Southern Illinois Award. Back row, left to right: Tyler Devine and Devin Lohrenz - Italian American Club Outstanding Student in Italian Language Award; Alex Castelli - Distinguished Student in Italian Language Honors Day Award; Dr. Thomas Lavallee, chair of the Department of Foreign Languages and Literature. Charles Witzke - The Gladys Oney Griffen German Scholarship. 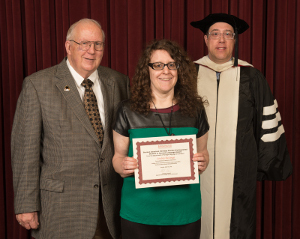 Honors Day for the College of Arts and Sciences at SIUE, April 19, 2015: Lindsey DeLonga, center, stands with Mr. John Wittenberg of the German American Heritage Society and Dr. Thomas Lavallee, chair of the Department of Foreign Languages and Literature at SIUE. Lindsey was one of two recipients of the 2015 German American Heritage Society Distinguished Student in German Language Award at SIUE. The other recipient, Cory Frances, was on a study abroad trip in Germany and did not attend the ceremony. Spanish for Health Professionals - Read the article in the Edwardsville Intelligencer here. Madison County Bar Association donates to Matt Melucci fund for Italian studies - Read the article in the Edwardsville Intelligencer here. Check out the new video from Study Abroad! Click here to see the video. Check out this year's Spanish Summer Camp here. News article on Mitch Morecraft, Spanish minor. Click here to read more. 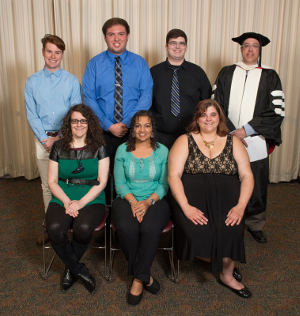 CAS Newsletter story on SIUE's very first Spanish honors society. Click here to read. Article on the Kimmel Leadership Awards which mentions our very own Carolyn Catalano. Click here to read. Graduating senior Kevin Flaiz will be representing our department at the Senior Assignment Showcase. He will speak from 2:45 to 3 pm on April 28, 2015 (Tuesday) in the Illinois Room of MUC. When: April 6, 5:30 p.m. When: April 20th, 5:30 p.m. When: April 27th, 5:30 p.m.
SIUE Student of Chinese has travel blog of adventure abroad in Shanghai. Click here to read! Announcement: Up-coming talk on current events in Ukraine by Prof. Olga Bezhanova. Click here for more information. Foreign Languages and Literature Education programs are fully recognized and accredited by CAEP / ACTFL! "I cannot handle it." Article in Belleville News Democrat about SIUE Fulbright scholar Ahmad Bshara's Midwest Winter experience. Click here to read. "A Connection to the Holocaust." Professor Carstens-Wickham attends summer seminar on the Holocaust at Northwestern University. Click here to read. "Scholar brings English Literature to 21st Century." Article in Edwardsville's The Intelligencer about visit by scholar Yannick LeBoulicaut. Click here to read/download. "Committee Focuses on Italian Studies." 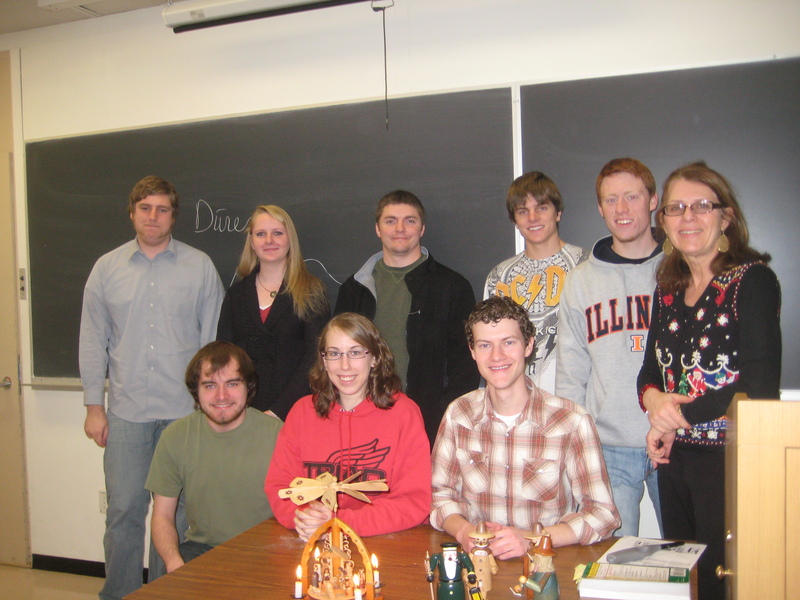 Article in Edwardsville's The Intelligencer about support for Italian Studies at SIUE. Click here to read/download. "Turkish Language a Bridge to Understanding." Article in Edwardsville's The Intelligencer about Fulbright scholar Nazil Aggun's teaching of Turkish at SIUE. Click here to read/download. "SIUE EUE class assists Spanish speakers in the area." 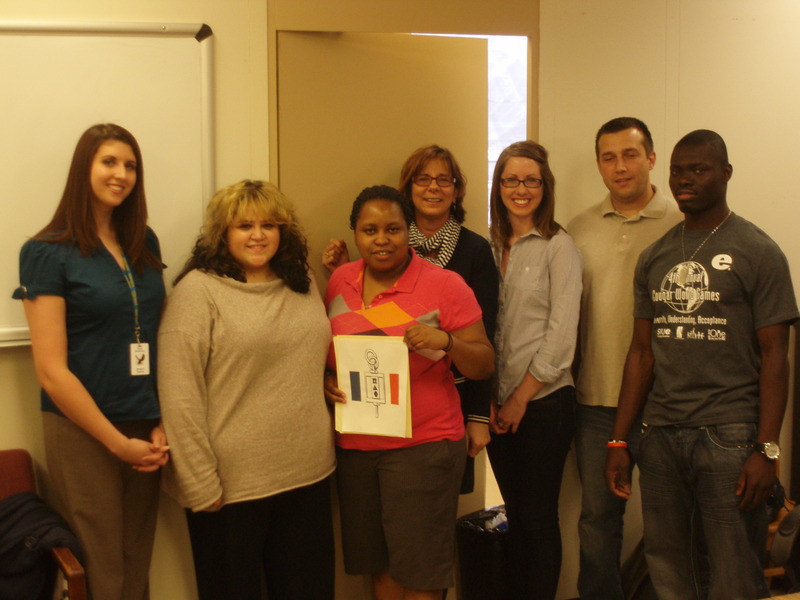 Article in Edwardsville's The Intelligencer about Carolina Rocha's service-learning course. Click here to read/download. "SIUE cooperates with Brazilian university, produces book on literary theory." Article in TWIC, the CAS Magazine. Click here to read/download. 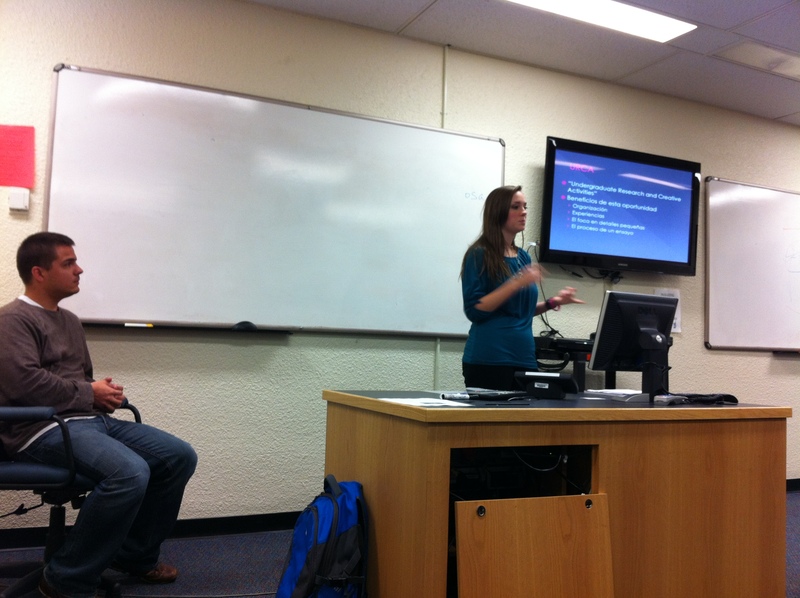 "Scholar introduces SIUE students to Yoruba." Article in Edwardsville's The Intelligencer about Yoruba language at SIUE. Click here to read/download. SIUE Alumnus, Prisoner in US Internment Camp speaks in Interdisciplinary Course. Article in The Alestle, SIUE's student newspaper. Click here to read/download. "Students learn more than Spanish in Spain." Article in Edwardsville's The Intelligencer about Study Abroad program to Seville, Spain. Click here to read/download. "Students gain teaching experience through SIUE Foreign Languages program." Article in TWIC, the CAS Magazine. Click here to read/download. "Sedycias' research unearths depth of Spanish playwright, earns Vanderbilt publication." Article in TWIC, the CAS Magazine. Click here to read/download. "High Aims for Hangzhou Study Abroad Program." Article in TWIC, the CAS Magazine. Click here to read/download. 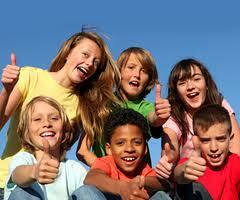 Summer 2013 Spanish Summer Camp! Click HERE for information on the up-coming program. Students will engage in a wide range of exciting learning and recreational activities that will develop their communication skills in Spanish. Students will be immersed in the culture of Latin-America as well by making traditional crafts and food such as piñatas, pyramids, jewelry, figurines, and tortillas. Students will also have the opportunity to develop their computer and Spanish writing skills as they play games, learn about the culture and practice vocabulary in the Foreign Language Lab. "Critical languages enter campus dialect." Article in The Alestle, SIUE's student newspaper. Click here to read/download. "SIUE now offering Critical Languages." Article in TWIC, the CAS Magazine. Click here to read/download. "SIUE to Begin Brazilian Exchange Program." Article in TWIC, the CAS Magazine. Click here to read/download. "We No Longer Live in a One-Language World." Article in Edwardsville's The Intelligencer about Department Chair Joao Sedycias. Click here to read/download. "The Department of Foreign Languages and Literature welcomes Sedycias on board." Article in TWIC, the CAS Magazine. Cick here to read/download. Front row, left to right: Arianna Gebauer, Emily Stahl and Nathan Thompson - Distinguished Student in Italian Language Honors Day Award; Stephanie Bloch and Kathleen Easlick-Hector R. Dominguez Award in Foreign Languages; Hannah White - German American Heritage Society Distinguished Student in German Language Award. Back row, left to right: Laura Straube - Helen D. Goode Memorial Scholarship; Jennifer DeMarco, Italian American Club Outstanding Student in Italian Language Award; Malorie DeFrancesco - Italian Cultural Association of Southern Illinois Award; Song Lim and Morgan McDaniel - Outstanding Student in Chinese Award; Dr. Joao Sedycias, Chair of the Department of Foreign Languages and Literature. "Mann Studies French and French Culture in the Modern World" - an article in the Intelligencer about Professor Debbie Mann. Click to download/read. SIUE student wins prestigious Gilman Scholarship. Read more here. 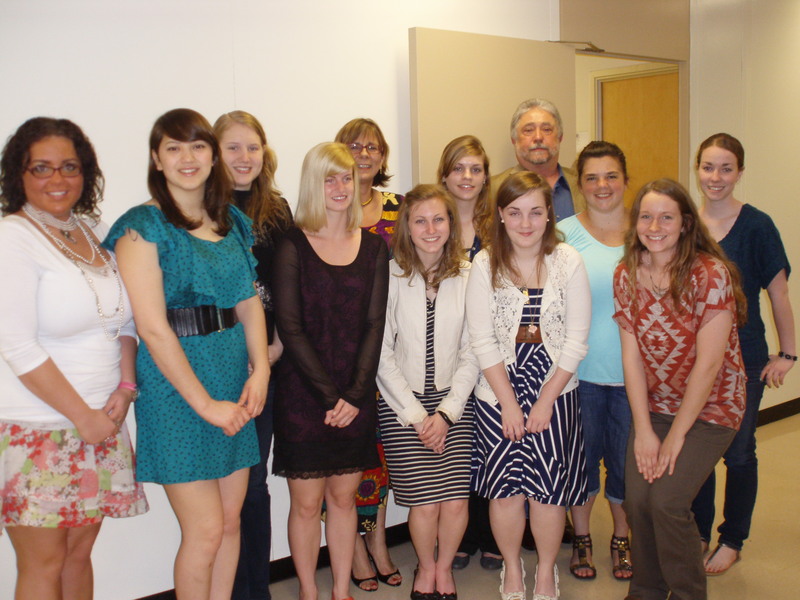 (Left) The Pi Delta Phi French Honor Society initiation ceremony was held on March 18, 2012. The department was represented by Foreign Languages Chair Dr. Joao Sedycias and faculty advisor Dr. Debbie Mann. Congratulations to the following students who were inducted into the SIUE chapter, Zeta Delta: Audrey Townsend, Julie Lisak, Mandi Noel, Jessica Vysoky, Ghillean Graber, Brittany Schuchman, Olivia Rader, Mike Allen, Emily Callis, Laura Straube, Amanda Kingery. Not pictured: Noah Kuester, Adrienne Krikorian, Cade Bauer-Showers, Jordan DeBo. Kate Eckert, one of our students, wins prestigious international Fulbright award. "I am honored to report that I have been accepted into the French graduate program at Florida State University, where I will be attending this fall after my graduation from SIUE this summer with a B.A. in French. Furthermore, I am delighted to accept FSU's offer of a graduate assistantship position, and am most eagerly anticipating working closely with the outstanding faculty and staff of the French department there. I intend to obtain my PhD, focusing my studies on French literature of the Middle Ages and the Renaissance. My experience with the Department of Foreign Languages and Literature here at SIUE has been absolutely phenomenal, and the education and preparation for graduate work I have received here is second to none. I am privileged to have had the opportunity to study French here at SIUE and cannot wait to begin my graduate studies at Florida State this fall." "Consejos para la investigación: cómo tener éxito en las clases de español avanzado." Hannah White, a German major was recently featured in the Alestle. Check it out. Last week, the Midwest Modern Language Association Annual Conference took place in St. Louis. Joshua Castillo and Kristina Becker, Spanish Majors and undergraduate research assistants (URCA) working with Dr. Rocha, attended the three panels of the section Children and Teenagers in Latin American Film. This proved to be an excellent opportunity for Joshua and Kristina to hear presentations about their topic of research and learn about professional conferences. NEW: Check out this pedagogical and informative blog about the experiences of SIUE students in their study abroad program to Seville, Spain during summer 2011. 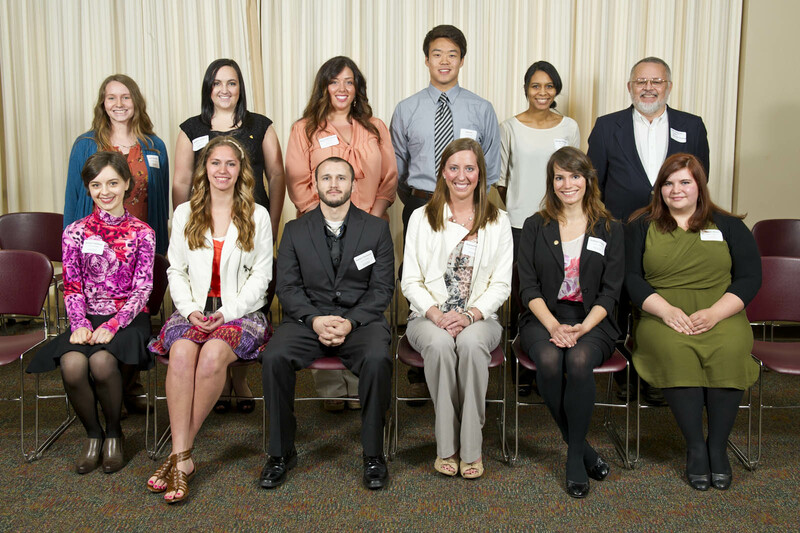 Picture (Left) from the Pi Delta Phi French Honor Society initiation (SIUE is the Zeta Delta Chapter) on April 1, 2011. The student's names are (from left to right) Brynna Murphy, Samantha Perez-Gillan, Elvire Kinha, Debbie Mann, Katie Hasler, Cédric Andreani and Sadick Doubare. 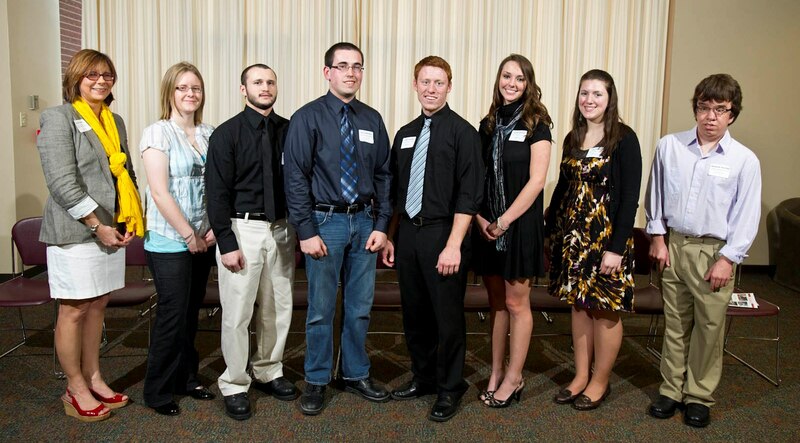 From left ,J. Debbie Mann- professor of Foreign Languages and Literature, Amanda Anderson and Nathan Thompson-Distinguished Student in Italian Language Honors Day Award, James Whitfield- German American Heritage Society Distinguished Student in German Language Award, Adam Tiemann-German Cultural Society Outstanding Student in German Language Award, Kristina Becker-Helen D. Goode Memorial Scholarship, Kate Eckert-The Gladys Oney Griffen German Scholarship, and Matthew Stoecklin-Outstanding Student in Chinese Award. Gabrielle Williams, Spanish Education Major, is graduating in the Spring 2011. During her junior year, she had an URCA for the Spring 2011, a competitive research position that allowed her to be engaged in undergraduate research. Gabrielle worked under the supervision of Dr. C. Rocha analyzing the film María Full of Grace as part of her Senior Spanish Essay. Because of her solid performance and service, she received the Senior Essay Standout Award given by the Office of the Provost. In addition, Gabrielle presented at the Saint Louis Symposium of French and Spanish in 2010 and 2011. Gabrielle has been hired by the Edwardsville Community Unit School District 7 to teach in Edwardsville High school. Congratulations, Gabrielle! Change for Haiti, a project by SPEAC has been selected for Outstanding Community Service Project of the Year for 2010-2011 at Southern Illinois University Edwardsville. This award is presented to a student organization that contributed to the enhancement of campus life and sponsored a community service project that contributed to the University or surrounding community. Congratulations to the SPEAC club! SPECIAL ANNOUNCEMENT: The SIUE STUDY ABROAD PROGRAM IN SEVILLE Application Deadline has been extended until January 18. You still have time to be part of an academic and life-changing experience. Get immersed in the exciting Andalusian culture of southern Spain, and get 6 credits of upper Spanish courses. Limited places available. For more information about this unique opportunity click on this link. Picture from Ben Sheet's B.A. German senior essay presentation. Fall 2010. NEW: Learn more about our new courses in Arabic here. View the Dept. of Foreign Languages and Literature's Newsletter for 2009.